Not all that long ago, tattoos were the trademarks of the punks, the bikers and other fearless misfits who wore them in proud defiance of societal norms. People who wore tattoos were stereotyped and stigmatized and when you spotted one in the street, you would turn around and speed off in the opposite direction. But things changed over the years. The very same reasons that made tattoos cool is now tasteless, overdone and overexposed. We now live in an era where Justin Bieber and Miley Cyrus have tattoos. My gosh, even Kristen Stewart has a tattoo. 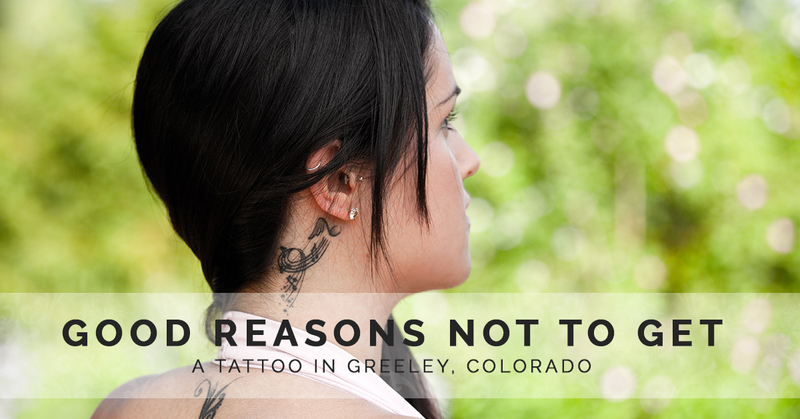 And even though you always have the option of tattoo removal in Greeley should you regert, er, regret getting a tattoo, there are plenty of reasons why they just aren’t a very smart move. Let’s face it, all the cool tattoo phrases are already taken, and even if you were to come up with some cool saying to ink into your skin, it’s just a matter of time before somebody steals it as their own. Cartoon characters? We are willing to bet you can pick a random city in the United States and every cartoon character will be represented on the skins of the population. Neologisms like “tribal tattoo” and “tramp stamp” show just how blase the tattoo has become. Now that stay-at-home moms and middle-aged professionals sport tattoos, your pathetic tattoo isn’t cool or edgy. It’s just ink on your body, big deal. As we write this, grandma and grandpa are lining up for matching tattoos. Tattoo artists are more common than real estate agents nowadays. The chances you wind up with artwork that is less than satisfying is pretty high. Maybe not today or next month, but there will come a time when you will regret that tattoo. Whether it’s when your grandson asks about the skull on your arm or the nurses snicker at unicorn on your buttocks while you are undergoing a colonoscopy, you will regret that tattoo. Getting a tattoo won’t make you look like David Beckham. A tattoo will not change your “cool” status. Basically, if you are a pathetic loser right now, getting a tattoo with only mean you are now a pathetic loser with a tattoo. End of story. There are any number of articles you can read about all the famous people and their tattoos. You can read about each and every one of David Beckham’s 40 tattoos and the meaning behind each one. And reading through this garbage is as interesting as a Marcel Proust novel. You could not convince us that we need a tattoo of our dog to commemorate him. That is just a bad idea. Even worse, though, is the family portrait on your back. Ever here about a thing called photographs? A family photograph can be framed and placed in a prominent place in your home for everybody to see. And you don’t have to take your shirt off to show it to people. What are you going to do when you get older, your skin starts to sag a bit, and your wife’s face droops to the left? Good times. Yep, you are in love and you are going to express your feelings by getting a tattoo. No, big mistake. With half of all marriages ending in divorce, it’s basically a coin flip that yours will endure, not very good odds if you plan on inking her name on your chest. Unless you belong to a Polynesian tribe, don’t get a tribal tattoo. Be proud of your own culture and get a tattoo that represents your roots. If you can’t think of one, go do a little history on Ancestry.com. It’s a good thing to learn about your roots. Because everyone knows what 冲洗 means. If you get a tattoo like that, you are in need of a lot of attention because you KNOW people will ask about it all day long. Mommy breast fed you way too long. What, are we in the 8th grade? Who gets a tattoo on a dare or because they felt pressure? 失败者, that’s who.